Are you already wondering how you’ll manage this season’s endless list of shopping sprees, holiday parties, and family gatherings? Not to worry, we have you covered. 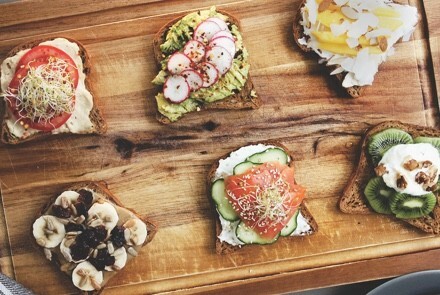 Schär’s energizing power toast recipes—all made on their healthy Artisan Baker 10 Grains & Seeds loaf—will give you all the energy you need this holiday season. Spread the hummus on one piece of toast. Layer the slices of tomato, followed by a pinch of sprouts. Top with the sprinkle of chili flakes. Top a slice of toast with smashed avocado and then layer on the radish slices. Sprinkle a pinch of sea salt and red chili flakes over the top. Finish with a drizzle of olive oil. Layer a piece of toast with slices of kiwi and a dollop of Greek yogurt. Top it off with the finely crushed walnuts. Spread almond butter over a piece of toast. Layer on sliced banana and a handful of dried cherries. Then, scatter the sunflower seeds over the top and end with a drizzle of honey. Cover a slice of toast with cream cheese. Then layer on the cucumber slices and slices of salmon. Top it off with sprouts and a sprinkle of sesame seeds. Spread the Greek yogurt over the slice of toast. Then, layer the mango slices on top and cover with almond slivers and coconut chips.